I want toner cartridges for the Oki C8600 printer. You specify 6000 pages fpor each toner but don't give the actual quantity of toner in each cartridge. How much is there? Terry Boyle. We're unable to provide you with this information. The standard measurement used by most, if not all, printer manufacturers to describe the capacity of a toner cartridge is to give a page yield based on 5% coverage of an A4 sheet. Therefore, we can only inform you that the Oki C8600 toner cartridges are designed to print approximately 6,000 pages per toner at 5% page coverage. The Oki C8600 is a unique colour laser printer offering A3 printing capability from a remarkably small machine. The compact C8600 is half the size of conventional A3 printers and is also extremely quiet. At 26ppm in colour and 32ppm in mono you get speedy output and documents are impressively sharp and bright when using Oki's superb microfine high definition toner. Original Oki C8600 toner cartridges are the best choice for your printer and give you perfect print quality as well as working more reliably to help extend the life of your laser printer. If you have run out of Oki C8600 toners but are tired of paying inflated prices at high street stores then don't give up just yet. This means we are continually striving to cut the cost of printing and by operating an efficient online business we like to pass on any savings we make to our customers. You can choose from a wide range of Oki C8600 supplies including black, cyan, magenta and yellow toner cartridges, image drums, fusers and more so feel free to start saving now. Not only do we offer you a discount on Oki C 8600 toners, we also provide free next day delivery so you don't have to pay a penny extra for ordering online! Just in case you thought it couldn't get any better our money back guarantee covers any purchase you make which means that buying our Oki C8600 cartridges is always completely risk free. Simply return any item as part of our no quibbles return policy in the unlikely event that you have received faulty or damaged goods. It really is that straightforward. There are no hidden catches or additonal costs for you to worry about and our award winning customer service team are on hand to make sure that you get 100% satisfaction on your order from Cartridge Save. 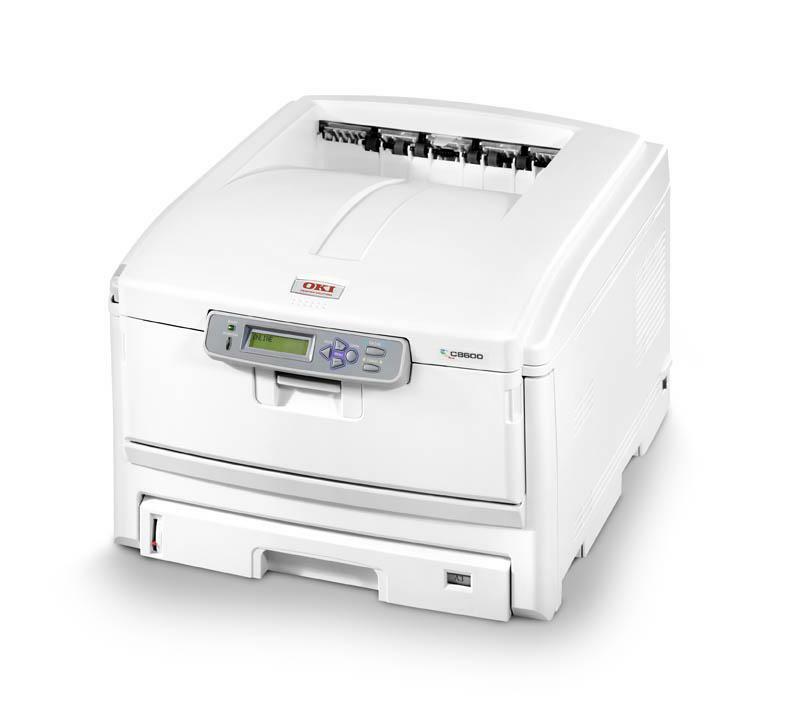 The Oki C8600 is a useful colour laser printer that can handle most small office needs, and will effortlessly handle print jobs over size A4. This printer can handle even photo print jobs at a respectable level of detail, and companies that have to print out multitudes of documents will be pleased by the fact that this printer is thrifty on ink, despite its high quality printing, and can generally manage about 6,000 pages per cartridge. Even better, print speed is fairly quick (though not as quick as the manufacturer says), and colour pages print out just as rapidly as black and white ones. Three trays, one A3, one A4, and one multipurpose, allow for duplex colour printing in several different sizes. The A3 tray can also handle A4 print jobs in landscape orientation. The uncomplicated display and control panel has only a few buttons and two 16-character display lines on a backlit LCD screen, making for easy navigation through options. The print technology used by the Oki C8600 allows it to be smaller than some printers meant to handle similar jobs; it uses high-definition LED strip illumination technology, rather than the usual laser beam, and has an in-line colour engine. Access to the Oki C8600 toner cartridges is easy, so replacing them isn't a big deal. While this printer does not print as fast as the manufacturer says it does, the Oki C8600 toner printer still is capable of generating about 8.3 pages per minute. It's black and white print quality is excellent, and has a gloss to it, which many people like. Block colour printing also turns out well. Since the C8600, although weighing in at 40 kg, is still lighter and smaller than many other printers designed for businesses to print large amounts of colour documents, it is an excellent addition to any office. The C8600 is heavy, and will probably require two people to lift. Additionally, installation is hindered by the fact that the process is quite complicated, and the setup guide provided difficult to navigate, not to mention printed in extremely small characters. The operation of the printer can get rather loud as well, due to the noise of the fans.